Plan your spring break looking at the accommodations in Florence offered by Tuscany Holiday Rent. Good news. On March the 23rd 2013 a great exhibition, “ The Spring of the Renaissance” will be held at Palazzo Strozzi in Florence. Jointly organized by Beatrice Paolozzi Strozzi, the director of the National Museum of Bargello, and by Marc Bormand, the conservateur en chef at the Department of Sculpture of the Louvre Museum, the exhibition is going to last up to August 18th 2013. After it will move to Paris, to the Louvre Museum, up to January 2014. The aim is to illustrate the genesis of the “miracle” of the Renaissance, that is the cultural and artistic renewal taking place in the15th and 16th centuries in Tuscany. A deep break separates the Middle Ages from the Renaissance. ” I have put you into the center of the universe – God says to Adam- in order for you to be free educator and master of thyself”. That is, according to one of the most glorious offspring of the period, the humanist Pico della Mirandola, the spirit of the Renaissance. Its issues such as liberty, individual creativity have to be spread to arts, morals, politics and sciences. In its new way, in its critical and aware perspective of looking at the world, Renaissance turns back to the classical world as the highest peak of human values versus the transcendental ones asserted by the medieval background . The intellectual movement which operates this new reading of the past is Humanism. Sculpture, as far as arts are concerned, is in fact the main artistic form to conceive and interpret the new style, which is not only a formal and aesthetic ideal, but a new way of understanding man in relation to universe and history. 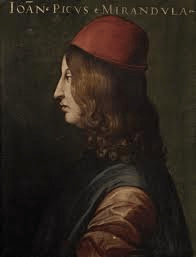 In the exhibition, divided into various sections, masterpieces by Brunelleschi, Ghiberti, Donatello, Luca della Robbia Andrea del Verrocchio interact with paintings by Masaccio, Beato Angelico, Filippo Lippi, Andrea del Castagno, Piero della Francesca. 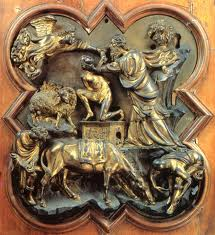 In1401 the medieval craft of wool announces a competition for a bronze door of the Baptistery in Florence. A biblical issue. The Sacrifice of Isaac is the proposed theme, including the well – defined characters of Abraham, his son Isaac, the angel stopping the sacrifice, the ram meant to replace Isaac, a donkey and two servants. 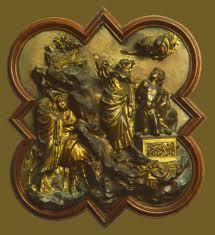 Ghiberti and Brunelleschi, the two competitors, though sharing the same cultural background, present works wide apart . Ghiberti, whose bas-relief was ultimately preferred for the still going-on late gothic culture offered an allegorically pleasant miniature. No drama in front of the event: on the left the two servants seems to be speaking to each other, unaware of the ongoing tragedy. To the right Abraham, on the act of sacrificing his son, does not betray any emotion whatever. The same for Isaac. The ram, quietly squatting next to a bus, completes the serene scene. In Brunelleschi’s work the role of the landscape is less prevailing, he chooses to emphasize the human and emotional values of the characters. In this sense, his work can become the artistic manifesto of the new era. Unlike the work of Ghiberti, Brunelleschi enhances the dynamism, the plasticity of bodies. The characters become actors, able to perform autonomous actions, thus strengthening the sacrifice, real emotional core of the composition. Even the angel appears here as a patent body in its compositional function of establishing a new line of force while preventing with its hand the sacrifice, in opposition to the one of Abraham. The exhibition is something more, an event which has to be appreciated on the spot through its direct appeal to both eye and heart. Questa voce è stata pubblicata in Art and accommodations e contrassegnata con Beatrice Paolozzi Strozzi, Ghiberti and Brunelleschi, Marc Bormand, “ The Spring of the Renaissance" at Palazzo Strozzi. Contrassegna il permalink.